Universal Input 100 V - 240 V AC, 50/60 Hz. We are a trusted name engaged in offering an excellent range of Dark Field Binocular Microscopes. 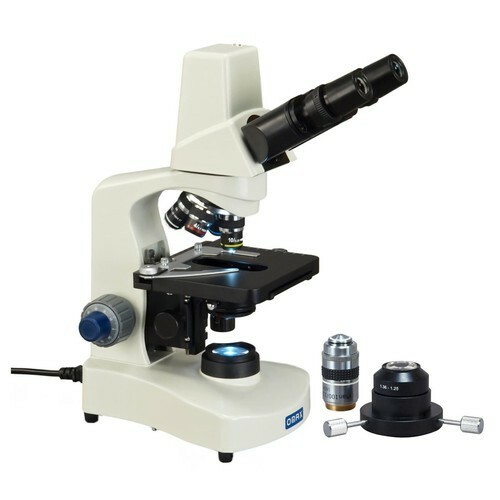 This binocular microscope is developed from the best quality components and hi tech technology in accordance with universally verified standards. Offered binocular microscope is accessible in varied specifications keeping in mind the needs of customers. Also, our binocular microscope is tested on several provisions for delivering a flawless range to customer’s end. BINOCULAR head inclined at 45 degree and rotatable in 360 degree fitted with highest quality prism to ensure highly accurate collimation for stain free observation. SEPARATE coarse and highly sensitive graduated fine focusing knobs reading upto 0.002 mm and Slide Safety topper. Substage DARK FIELD condenser NA 1.25 fitted with iris diaphragm and swing out filter holder with blue filter moving up and down through rack and pinion mechanism. Packed in shockproof Styrofoam molded box or in a plywood cabinet having provision for placing eyepieces, objectives. Detachable power cord and 3 pin-plug.